What's My Colony Green Condo Worth in May 2017? You are here: Home / Colony Green / What’s My Colony Green Condo Worth in May 2017? This is a Colony Green Condominiums market activity report for May 2017. This report is comprised of statistical data extracted from May 1st through May 31, 2017 from our local Multiple Listing Service (“MLS”) as of June 1, 2017. There are currently two pending sales that will most likely be reported in the June report. A “C Unit” which is the townhome style center unit. This is a 3 bedroom 1,260 square feet condo with 1 full bathroom and a half bath downstairs. The MLS reports it listed at $575,000 on March 20, 2017. The MLS also shows that it went under contract on the same day. The MLS reported the sale closed on May 3, 2017. Reported closed sale price was $580,000. Buyer had FHA financing. MLS notes the Seller took a preemptive offer. That means that the seller accepted an offer prior to listing the home on the MLS. A “B Unit” which is the downstairs end unit which has 2 bedrooms, 1 bathroom, 942 square feet. It listed on March 31, 2017 at $520,000. It went under contract on April 5, 2017 and closed on May 5, 2017. Reported closed sale price was $530,000. The buyer had conventional financing. A”D Unit” which is the townhome style end unit. 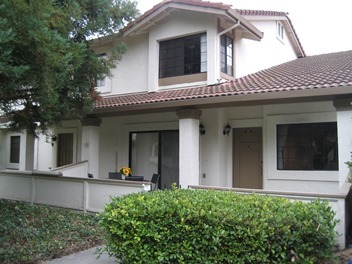 This is a 2 bedroom 1,294 square feet condo with 2 full bathrooms and a half bath downstairs. It listed on May 14, 2017. List Price $565,000. It was reported pending or under contract on May 15, 2017. The reported sales price May 16, 2017 was $580,000. MLS indicates the condo was sold off market. It was entered into the MLS for comp purposes only. While roosters are not allowed in the City of San Jose, and certainly not allowed in the community, Colony Green does have a resident rooster which I have affectionately named, Mr. Green Jeans. You can read about Mr. Green Jeans in my most recent post Mr. Green Jeans The Colony Green Rooster. I do hope to rescue him and take him to a sanctuary in Clayton. If you would like more detailed information about the Colony Green Condo community in Blossom Valley contact me at 408.972.1822. No one knows the Colony Green Condo Community better than Kathleen Daniels. I am an original owner and I live here.